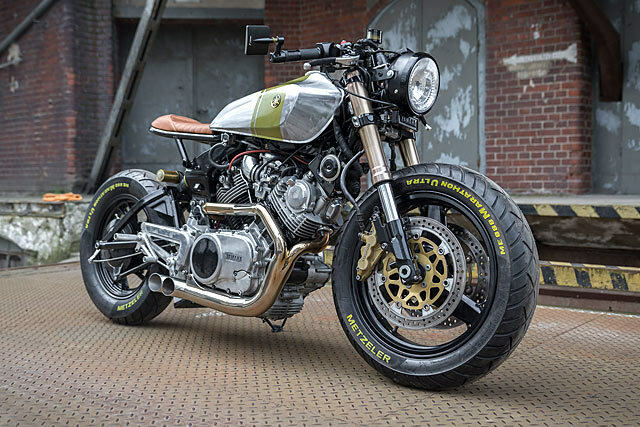 The 31-year-old Beker makes his moola by day as an IT professional but his very understanding wife has allowed him to pursue his love of ’70s and ’80s motorcycles through his Ugly Motors venture on the side. 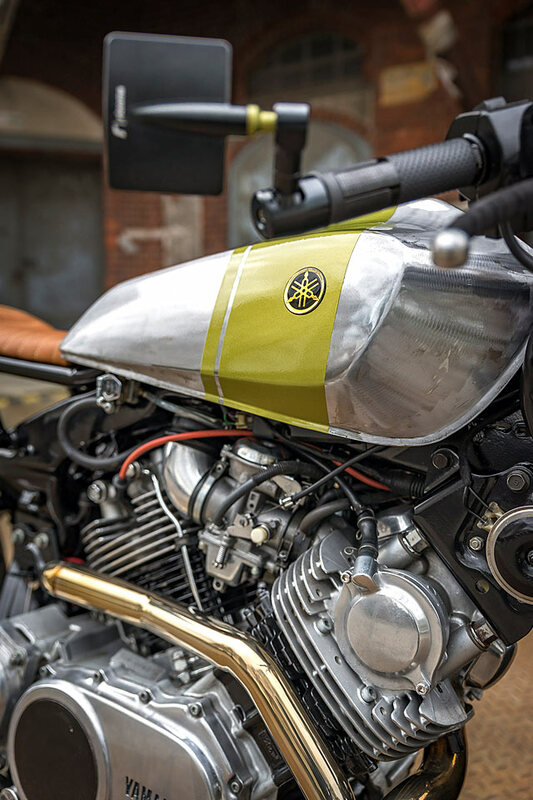 Over recent years he’s crafted a growing collection of bikes from the period and built up the workshops fit-out as he’s honed his own skills. The client for this build had seen Jakub’s work online and when they met in October last year he knew what he wanted! “My client was very aware of what he liked and got very good taste of colour matching and features he wants and the ones he wants to skip just by a simple law of budget.” There was another catch though, not only was budget a concern for the client, so too was the speed he wanted the bike turned around. So with this in mind Jakub told him the donor bike would have to be in good condition. Just a day later the client had found this ’83 Virago in great nick, a US model brought to Poland by an old man in Gdańsk. It meant work could commence immediately and fickle finances wouldn’t be blown on sorting out a bunch of problems you always find in “99% complete” donor machines. 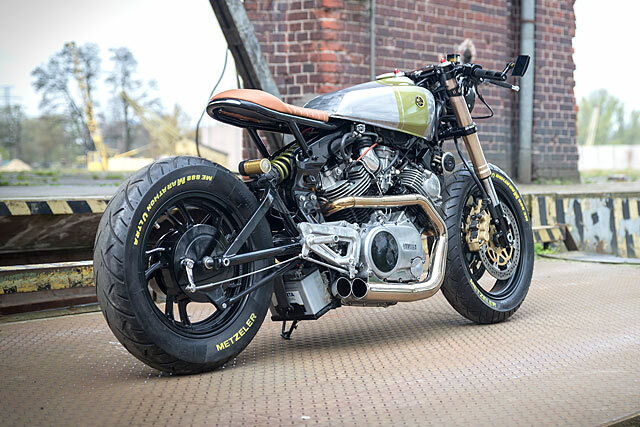 “After I’ve picked up the bike in October I’ve setup a clean and fluid process, it was easy enough because I’ve made an XV750 just one year ago,” explains Jakub. 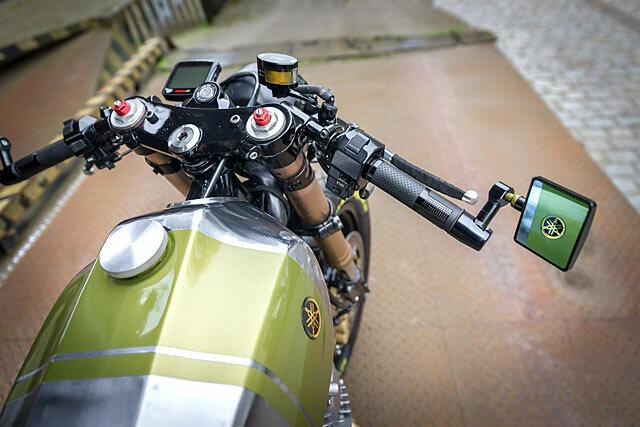 The first step was to sort the suspension and with the XV920 nearly 240kg wet, a lightweight sportsbike front end is hardly the perfect match. A set of Kawasaki ZX12R forks get the job but Jakub was no fan of the standard upper clamp. It comes with integrated bars, so he made a new upper triple for a much cleaner finish and then bolted a set of traditional clip-ons underneath. The ZX also donates its dinner plate sized twin 320mm front discs with Tokico calipers. 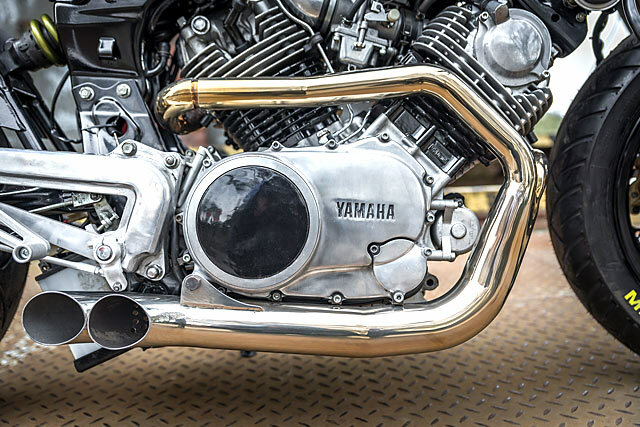 While the lightweight front wheel joins the stock hub drive Yamaha item in being wrapped up in muscle-bound Metzeler rubber. To sort out the leaky rear shock another dive into the Japanese parts bin was required. Beker came up holding a Honda CBR 954RR unit that both improves the handling and lowers the ride height. To get it to fit a new shock mount was fab’d up in-house and the rolling chassis was complete. With the stance set, laying out the design of the minimal bodywork was a far easier task and the goal, “Simple and Clean”! The bulky sub frame was cut off and thrown out the first floor, heads up below, and Jakub fired up the welder. Using 1″ steel tube he’s fabricated a brilliant rear end that’s all business, just enough to hold the seat and no more. This piece also dictated the way the tank would be mounted but it was in the paint work that things would get creative. There is no primary colour, instead the tank has been zinc coated that allows the grinder marks to remain without ever rusting. The industrial look is topped off with olive-gold race stripes before the whole lot was given a heavy clear coat for extra protection. Such a look required that everything else was either sharing the theme or out of sight. The lighting is the latter, an LED strip that includes the brake light and indicators which Jakub frenched into the subframe. The headlight does the same with the classic 7″ round shape taking a modern twist, integrated indicators keeping the lines clean. While the seat is back alley brilliance with a touch of Italian chic, high quality tan leather stitched to perfection. …beautiful tank doesn’t hurt, either. 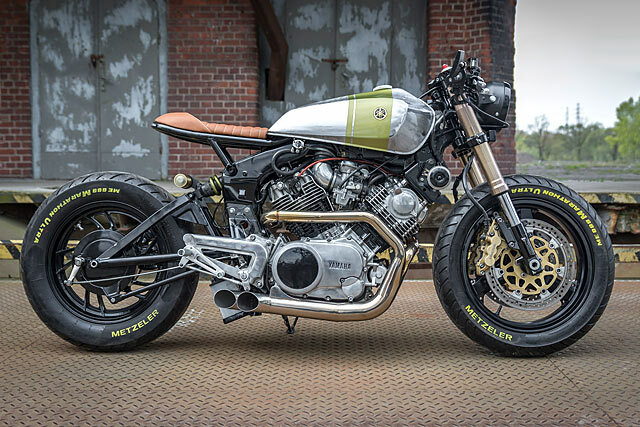 Now in the homeward stretch attention turned to the big v-twin power plant that makes the Virago such a popular donor bike. But a great engine is no good if it won’t go, so to address the common starter problems Jakub ordered all new parts from the nearest Yamaha dealer. 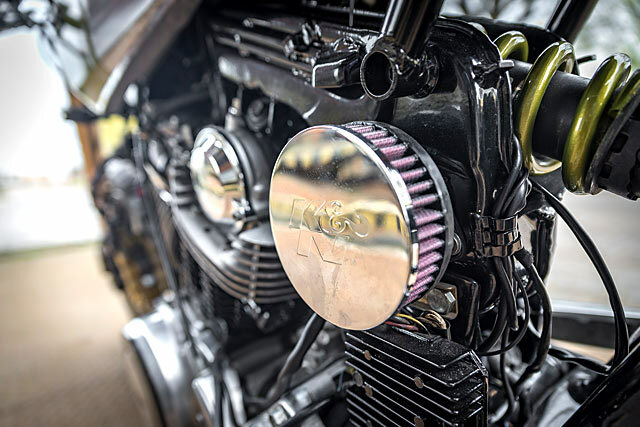 The engine cleans up nicely with a mix and match of polished metal and black accents, while a chrome K&N filter hangs off the side. 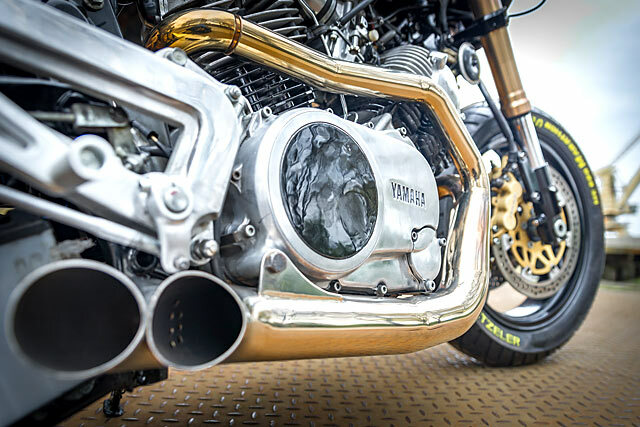 But the real stand out statement comes from the amazing pipework; the exhaust perfectly hugging the engine, even mimicking the cylinder heads lines. With the power cruiser side of the equation taken care of the rest of the work was about giving his client the best of rides. To tuck down and match the cafe-style clip-ons a set of custom alloy rearsets are mounted where the pillion pegs once would have been. The horrible factory instrument cluster makes way for a digital Koso dash. While new grips and adjustable levers are some 21st century touches that take nothing away from the backyard bruiser styling. Finally mounting a big arse battery under the swingarm means the XV will never be short of the required CCA’s on a freezing polish morning! 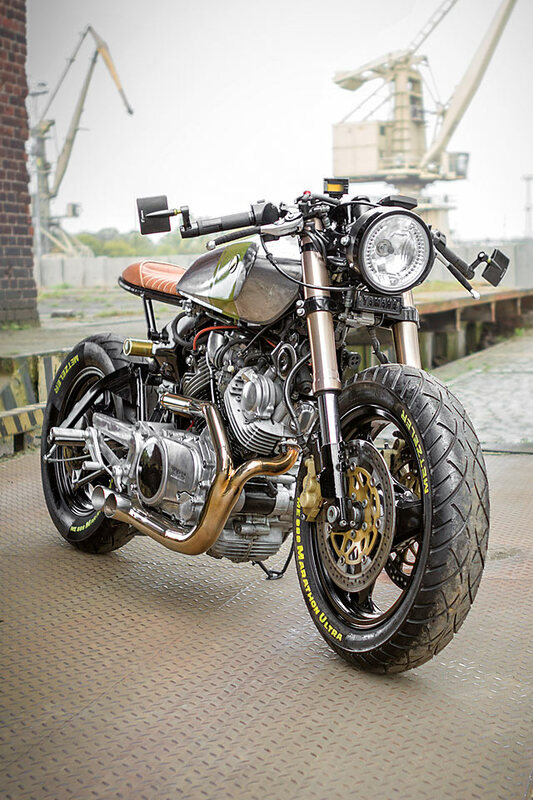 A finished bike at the Ugly Motors workshop still has one last test to pass and now the stakes are much higher. Strapped to the home-made crane, it’s pushed out the window of the 1st storey laboratory of speed and gently lowered down to the friendly tarmac below. “It was extreme for the first time!” Jakub says with a smile, but these are the measures many are willing to go; such is the addiction and drive for bike builder and client alike. And when the results are this good, a few seconds of potential pain for a lifetime’s Yamaha pleasure is a very small price to pay.